Dubuque, San Diego, San Francisco, Kansas City MO, Tulsa, Springfield-Cape Girardeau, Winona, Sioux Falls, Sioux City, Davenport, Indianapolis, Norwich, Youngstown, Louisville, Green Bay, Tulsa Evansville, Gary, Lexington, Buffalo, Owensboro, NFPC (USA) Convention, St. Augustine, Columbus, Toledo, Chicago, Saginaw, Kansas City KS, New York, Grand Rapids, Hartford, Belleville, Boston, Salt Lake City, Reno, Portland ME, Sacramento, Trenton. Fresno, Springfield ILL, Houston-Galveston, Richmond, Savannah, Knoxville, Lafayette IND, New Orleans, Tuam in Ireland, Cardiff in Wales, Winnipeg (Manitoba), Bridgeport, Trenton II, Nassau, Little Rock, Salina, Joliet, Baton Rouge, Ogdensburg, Metuchen, USCCB Bishops Spring Meeting (Florida), Baltimore, Atlanta, Dodge City, Priests in Their First Ten Years Conference (Province of Ontario, 2013) New Ulm, San Jose, San Bernardino, London (Ontario), Lansing, Des Moines, Boston II, Saskatoon-Prince Albert BC, NFPC (Canada) Convention, Monastic Retreat St. Meinrad Archabbey, Jefferson City, Bishops of Catholic Extension Society (Chicago), Pittsburgh, Toronto I and II, Oklahoma City, Hamilton (Ontario), Denver, Memphis I and II, Beaumont (Texas) I and II, Canon Law Society Convention (Pittsburgh), Monastic Retreat St. Benedict Abbey (Kansas) Kamloops BC, Kingston (Ontario), Victoria BC, Monterrey (California), Nelson BC, Regina (Saskatchewan), Scranton I and II (Pennsylvania), Corner Brook-Labrador (Newfoundland), Sault Ste. Marie (Ontario). Portland (Oregon), Pembroke (Ontario), Kingstown (St. Vincent and the Grenadines I,II and III), Ikot Ekpene (Nigeria) and Port Harcourt (Nigeria) (under consideration). The Priest Planning Committee - Msgr. David Bohr, Chairman, on the right. We met at Skytop Lodge in the Pocono Mountains. They have @100 priests. Half came this year and I will go back to give the same material to the other half. 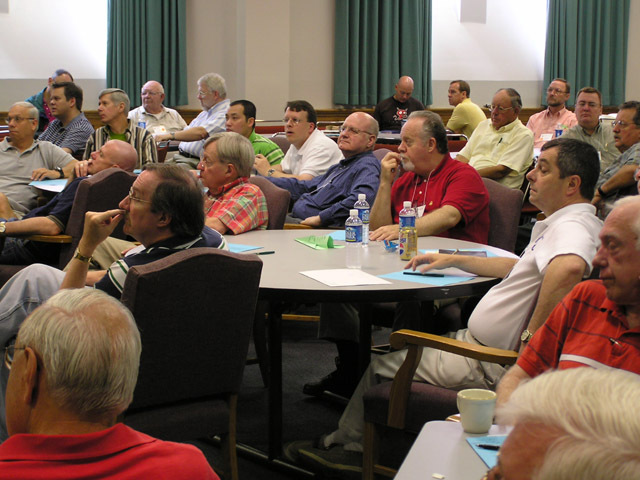 My topic, here and most places, is "The Powerful Spiritual Leadership of a Unified Presbyterate," a conference on priests working together as a team with the bishop to deliver high quality service to the members of the Church. Like most dioceses, they usually choose a restful get-away place. They certainly hit the mark here. Skytop Lodge was completed in 1928 as a resort for the rich and famous. 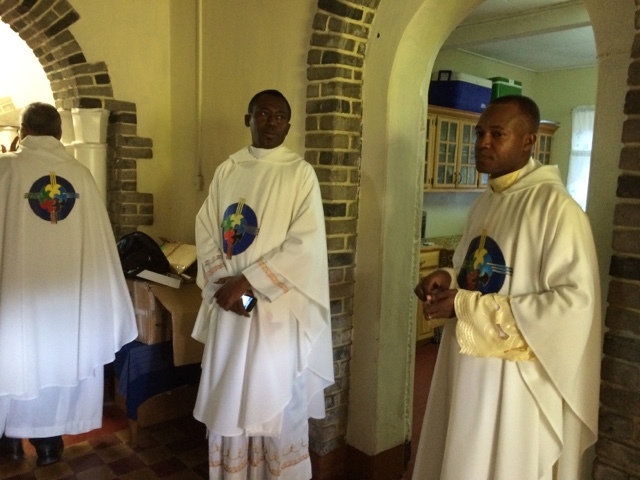 Bishop Bambera celebrating Mass with his priests. There are 834 priests, three auxiliary bishops, 559 Sisters, 131 Deacons, 52 Brothers and 1,853,582 Catholics in the Archdiocese of Toronto. Cardinal Thomas Collins is the archbishop. I led their 2013 convocation in two one-week segments. Cardinal Collins invited me back to lead their 2014 convocation. 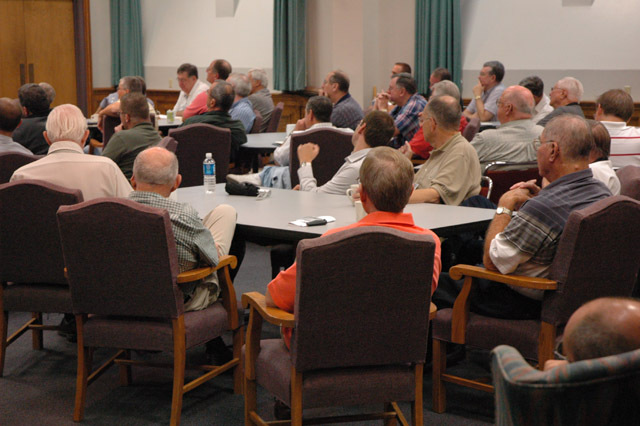 I did two more one-week segments and, at his request, stayed another week to present the material from 2013 to his seminarians at St. Augustine Seminary. We were joined by the seminarians from the Neocatechmenal Way seminary, Redemptoris Mater Seminary, which is next door to St. Augustine Seminary. Before I agreed to coming back in 2014, I asked Cardinal Collins to come to St. Meinrad. To my surprise, he agreed. 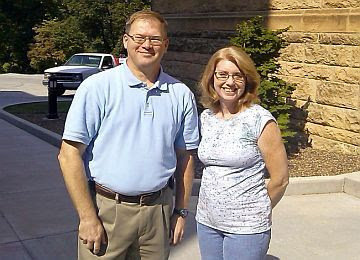 He gave the prayer day to open the 2014-2015 school year at Saint Meinrad Seminary last September. I was invited by Father Saba to join the parish in the rosary on Wednesday night. They prayed the rosary in Aramaic, the language that Jesus spoke. Hearing them speak in the language of Jesus was moving indeed. At the end, they asked me to give them a blessing in English, of course! 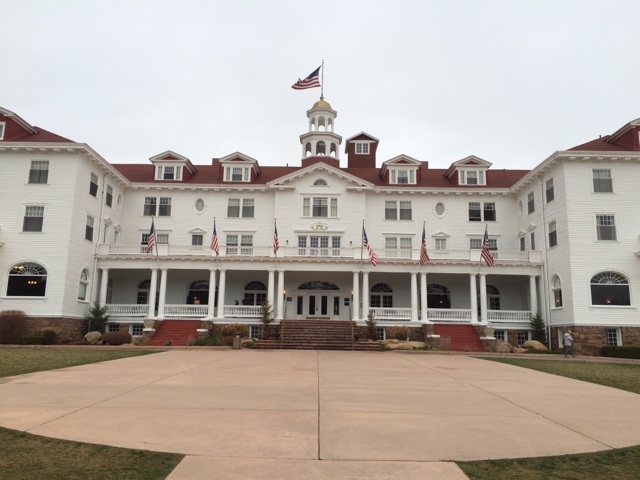 Estes Park, Colorado where the movie, "The Shining," was filmed. Over the years I have worked with some wonderful people - people who often worked with low pay and sometimes even little appreciation. In this posting, I want to affirm, thank, show my appreciation once again and tell the world about their talent, dedication and hard work. 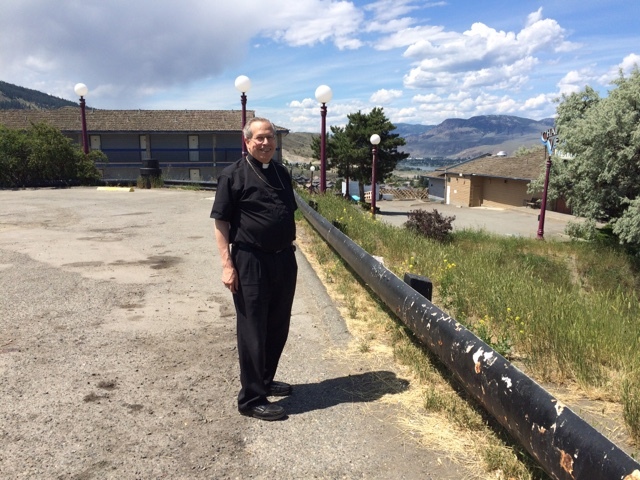 Often, it is the priest who is remembered after he leaves a parish or ministry assignment. Sometimes he even gets the credit for all the successes and accomplishments. 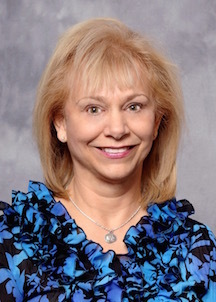 I tried to affirm them while I was working with them, especially when I moved on, but in case I didn't do enough, I want to throw a spotlight of appreciation on some of the staff members I have worked with over the years. Before coming to Louisville, I did not have paid staff members, but several wonderful volunteers, too many to mention. I have never forgotten them and I want to affirm them as well. I often get the credit, along with Christy Brown, for all that happened during the revitalization of the cathedral. It is this team that really helped bring about the restoration of the cathedral parish and its traditional ministries. There are many other part-time workers like Louise Nevitt, Fred Isert, Robert Baker, Michael Steitz, Shirley Jones, Chrissy McCullough, Larry Love, David Barickman, Phillip Burkhead and others. Linda Banker was my full time assistant during my years there and for several years after I left. She is now a very effective chaplain at Sacred Heart Home. There were several others who overlapped with us or who assisted us full or part-time including Michelle Herberger, Carolyn Kupper, Sister Anita Lowe, OSB and Ian Massey. Father Ronald Hodges, now a priest of the Davenport Diocese, (formerly Father Gabriel OSB of Saint Meinrad Archabbey), helped implement many of the early Institute for Priests and Presbyterates programs. Joseph Cook and Lea Ann Olinger. 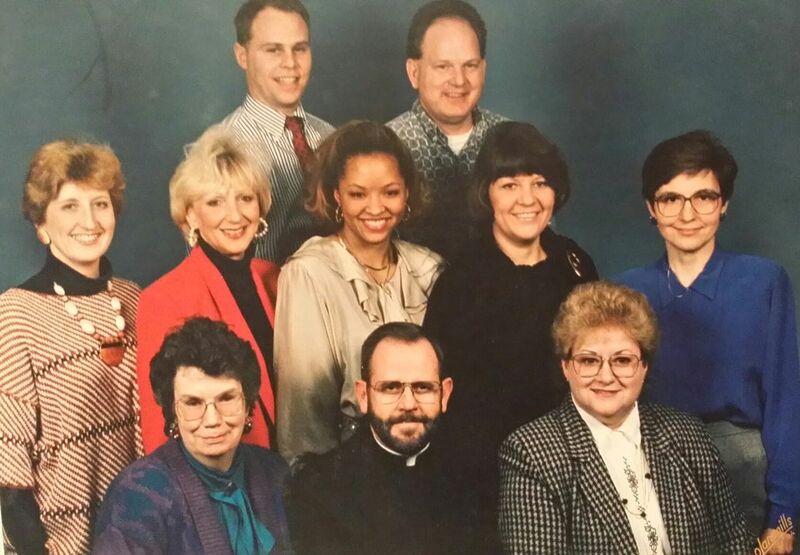 Lea Ann and I were together the whole time I was Director of the Institute for Priests and Presbyterates. Joe came after Father Gabriel left. Like the many I worked with before, these two staff members are competent, dedicated, hard-working and a pleasure to work with, day in and day out. There are heroically carrying on while they wait for a new director to come on board. Melanie Prejean-Sullivan, Director of Campus Ministry, and Karen Shadle, Associate Director of Catholic Worship and Campus Ministry. Melanie and I started our 16th year of working together this fall. Melanie is another of those prize partners in ministry. Karen joined us a few years ago. Her abilities are appreciated, especially her music and liturgy abilities. She fulfilled a dream Melanie and I have had for many years. Friars George, Antony and John (Conventual Franciscan priests from India) are also helping us out in campus ministry especially during the week and when I have to be gone on Sunday nights. Here they were serving up snow cones that the campus ministry program was giving out to welcome students back on campus. Great guys! A real asset! My retired doctor, Dr. Kevin Curran, once said to me at the end of one of my annual physicals, "Father Knott, you need to get off the banquet circuit." He was, of course, referring to my weight. Since I lead so many priest convocations here and abroad, banquets are indeed one of the hazards of my job. However, it cannot all be blamed on banquets. As I wrote in a previous post, since I retired I like to go to Sunergos Coffee Shop on Preston many mornings when I am home. 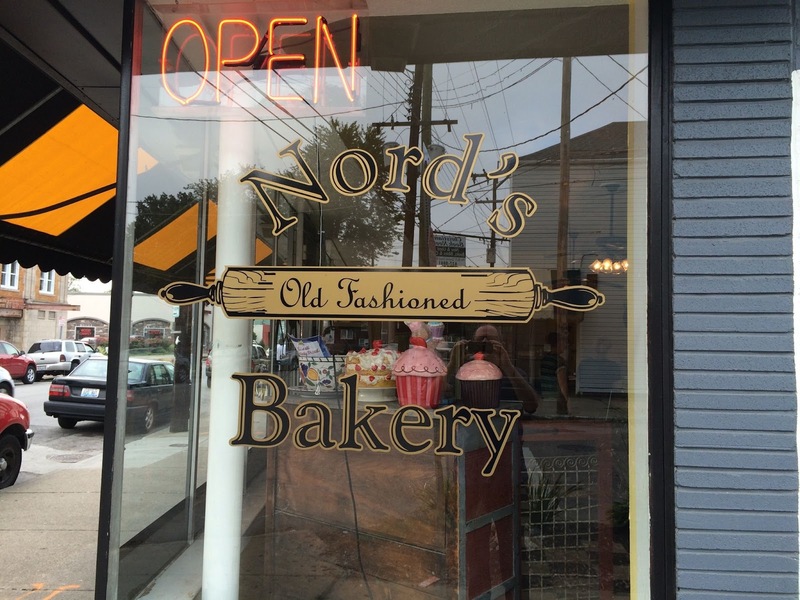 Next to the coffee shop is Nord's Old Fashioned Bakery. I have been going there even before Sunergos opened. If you go there often, it's one of those places where "everybody knows your name." Sometimes the lines are so long, you would think it is one of those new "drug stores" in Colorado. I do believe their doughnuts are addictive. I even volunteered to work there when I was on sabbatical, which caused many customers to take a "double take." "Hey, aren't you ... uh ... Father Knott?" 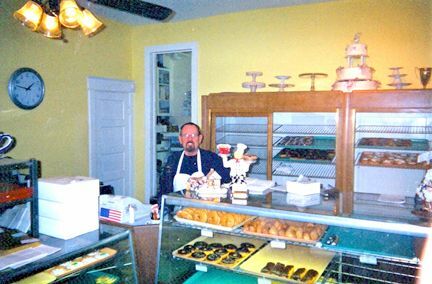 Mike Nord, "The Cake and Doughnut Boss of Germantown"
ASK FOR MIKE! TELL HIM FATHER KNOTT SENT YOU! MAYBE I'LL GET A FREE DOUGHNUT! 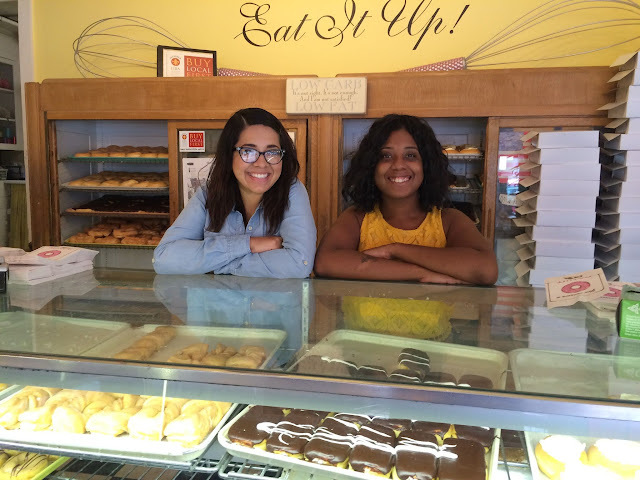 Two of my "doughnut pusher" friends: Evelyn Martinez and Jasmine Betts.